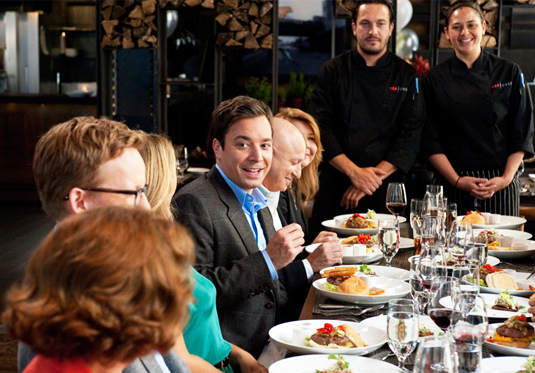 Last night was the part of the “Top Chef” season that everyone looks forward to–contestants, judges and viewers. 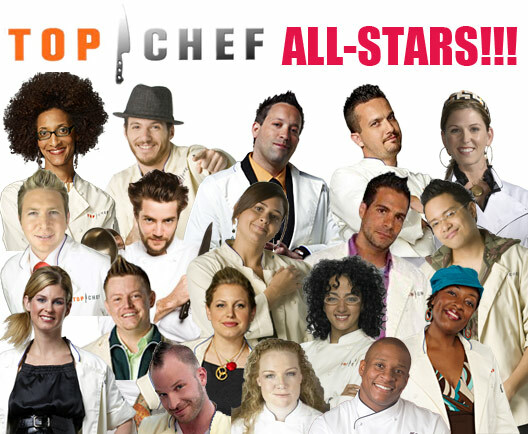 But it was especially cool for “Top Chef All-Stars,” and the show began last night with Antonia mentioning how she seems to be bad luck to fellow teammates, who kept getting eliminated around her. Anthony Bourdain hosted the quick fire challenge at Eric Ripert’s Le Bernardin restaurant, and this dude, Justo Thomas, was butchering fish like a madman. This guy is amazing…he can cut perfect portions of fish while leaving a carcass and skin, and do it in like 8 minutes. The challenge was to do this in 10 minutes, butchering portions of cod and fluke. The top four would compete for immunity by making a dish or dishes using all parts of the discarded fish–head, bones, skin, etc. (BLECH!!!!!) in the elimination challenge. In the bottom were Fabio, Tiffany, Carla and Antonia, and the best were Dale, Richard, Mike and Marcel. Dale won with his Fluke backfin sashimi with fluke liver sauce, and he had immunity for the main challenge. If you follow “Top Chef All-Stars” on Bravo carefully, you know that Jamie has been skating for weeks. Whether it was a finger cut that required stitches, hiding when her dish should have been presented to judges, or playing it safe as others were eliminated for taking bigger risks, she just clearly didn’t belong here. With that, here is our recap of last night’s episode…. The show began with Jamie feeling quite lucky and being surprised that she was not eliminated last week, and rather that Casey was sent packing after the chicken feet debacle. Then they showed Marcel acting like a total douchebag toward Dale because Dale did not follow the challenge rules properly, yet won. Last night’s episode of “Top Chef All-Stars” was mostly shot at the site of the US Open tennis tournament in Flushing, New York, which took place back in August and September. Anyway, host Padma Lakshmi along with Top Chef Master Tony Mantuano announced the quickfire challenge, which was to make some sort of holiday stuffing. Of course, they couldn’t make it that easy. The chef-testants were asked to do this without using any utensils and having to be as resourceful as possible. The winner would receive both immunity this week AND $20K. Wow. Tony’s least favorites were Carla’s quinoa, which she jokingly referred to as “undente,” meaning it was not cooked enough. She knew it and so did Tony. He also didn’t like Tiffani’s sweet maple stuffing because it was too sweet; and Casey’s mushroom dish, which didn’t really resemble stuffing at all. His faves were Tre’s cheddar/bacon/chili cornbread stuffing; and Marcel’s stuffing with raisin brioche, cherries and currants. Tre was the winner, so he had immunity this week as well as a cool 20 grand. Nice! 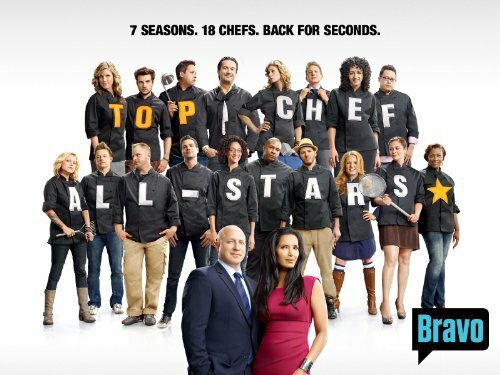 The episode of Top Chef All-Stars began this week with shock that Jen was sent home last week. Really, it’s going to be a shocking elimination every week with this cast of heavyweights, isn’t it? But many of them felt Jamie deserved to go home since she got hurt and went to the hospital, thus skating by last week. Then the quick fire was announced with host Padma Lakshmi and chef David Chang. They would break into four random teams, based on how they were standing at the moment. They would each have the same ingredients to work with–to prep and create a meal as quickly as possible using lamb, garlic and artichokes.